Before I have even climbed out of the car I notice a flight of cockatoos gliding low towards the grassy oval where they settle to feed on tubers and roots. 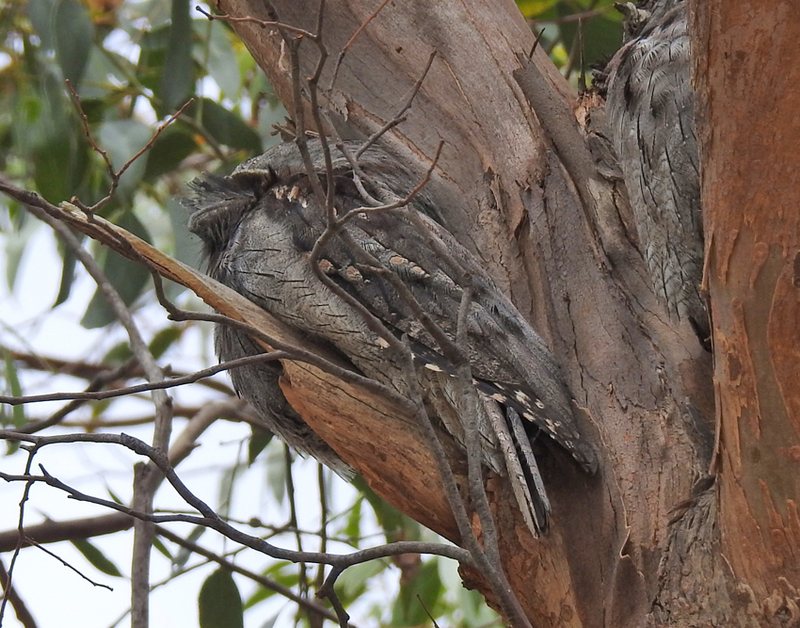 Then from the trail head I spot a pair of tawny frogmouths high in one of the stringy barks that dominate the area. These fascinating owl-like birds are nocturnal and use the fine whiskery feathers to locate prey in the dark. Their camouflage is superb making them appear to be an extension of the branches they cling to during the daylight hours. 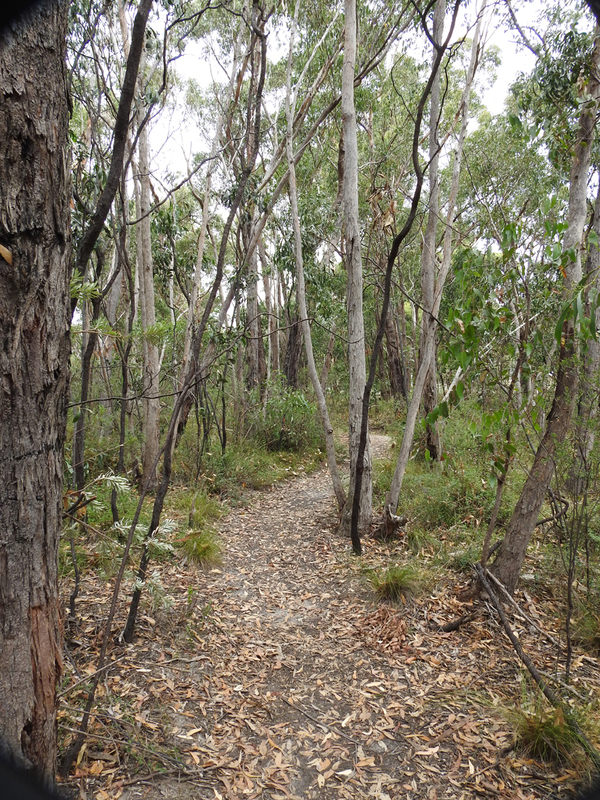 I am exploring the trails around the heritage listed Jupiter Creek Gold Diggings. They are located in the Kuitpo Forest area and were mined intermittently between the 1860s and 1930s. The diggings are now a heritage site and a great place to go for an historic and wildlife wander. Today the weather is a little on the bleak side; not characteristic of South Australia’s habitually warm spring season. But the light adds softness to the bushland setting while providing many photographic challenges as I try trying to capture acceptable images of the constantly moving wildlife. 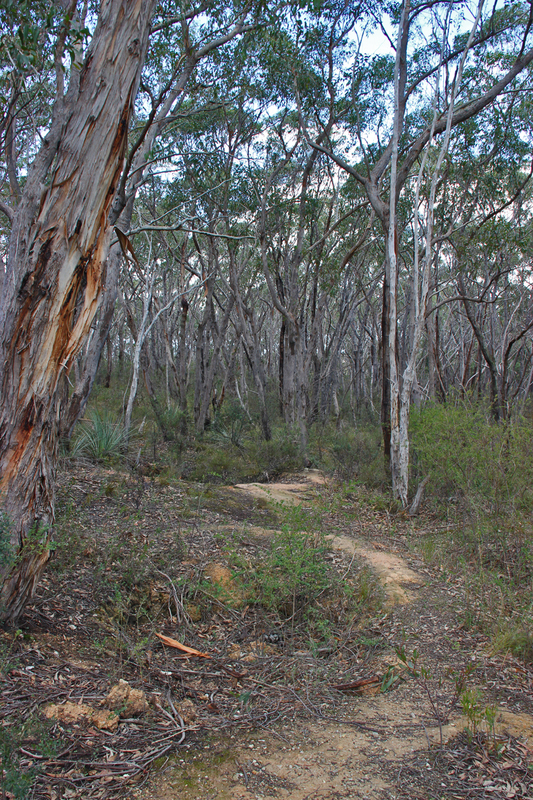 A little further along one of the trails that leads to the diggings I hear the bell-like chimes of a grey currawong. Eventually the bird flies between some trees and I am able to get a clear shot as it perches high in the branches framed by a rare patch of blue sky. There are many small birds flitting between the branches and amongst the wattle and pea bushes that form the mid story. 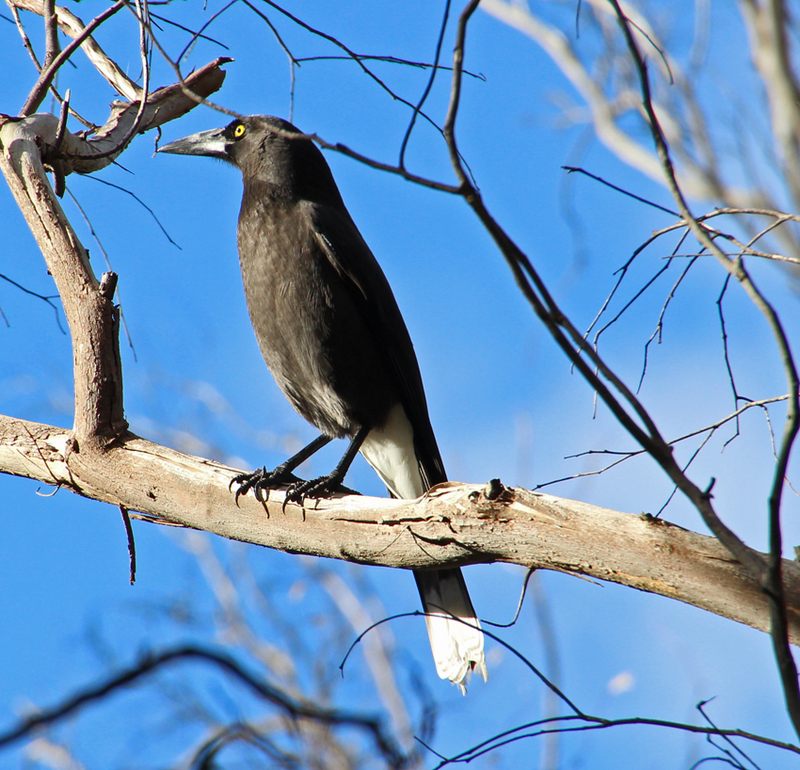 I catch glimpses of fairy wrens, tree creepers and even a crescent honeyeater. 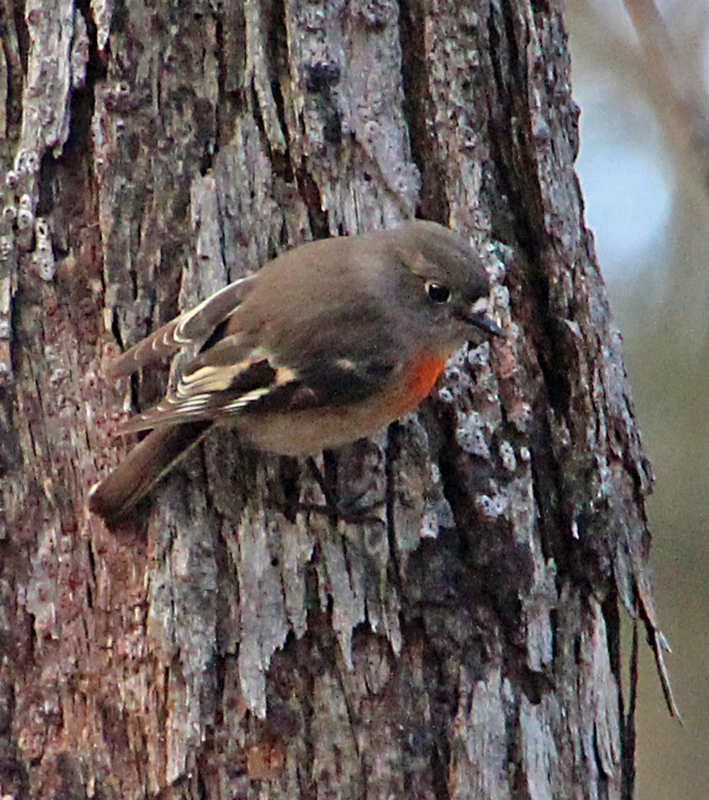 Eventually a female scarlet robin lands on the trunk of a large eucalypt and begins to forage between the layers of bark for grubs, spiders and insects. In the low light I have to steady the camera against a branch to make the shot. Although only the first vestiges of Spring have graced the state a few insects and spiders are emerging from their winter dormancy. Numerous webs are strung between the lower branches of bushes and trees. 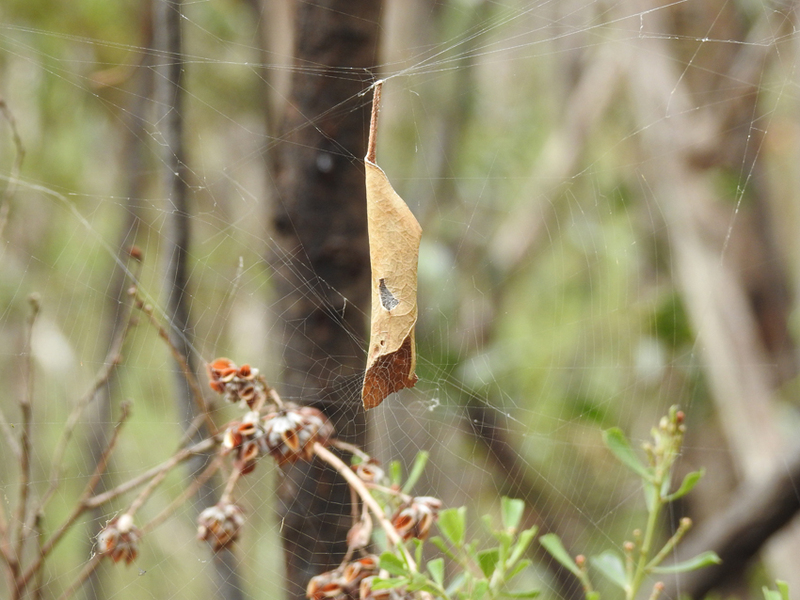 Curled leaves are suspended in many of the webs in what, at first, seems a random fashion. 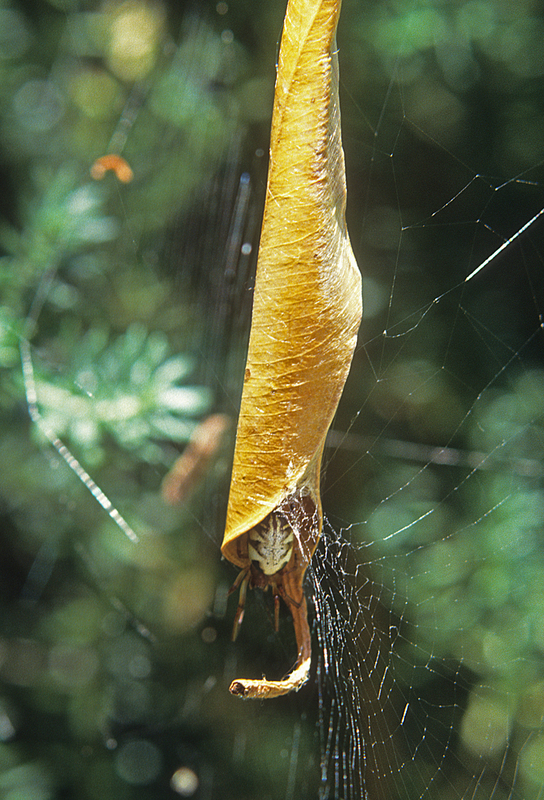 However, closer examination shows this web and leaf combination is home to leaf-curling spiders that use silk to draw in the sides of the elongated eucalypt leaves to form a tubular shelter. 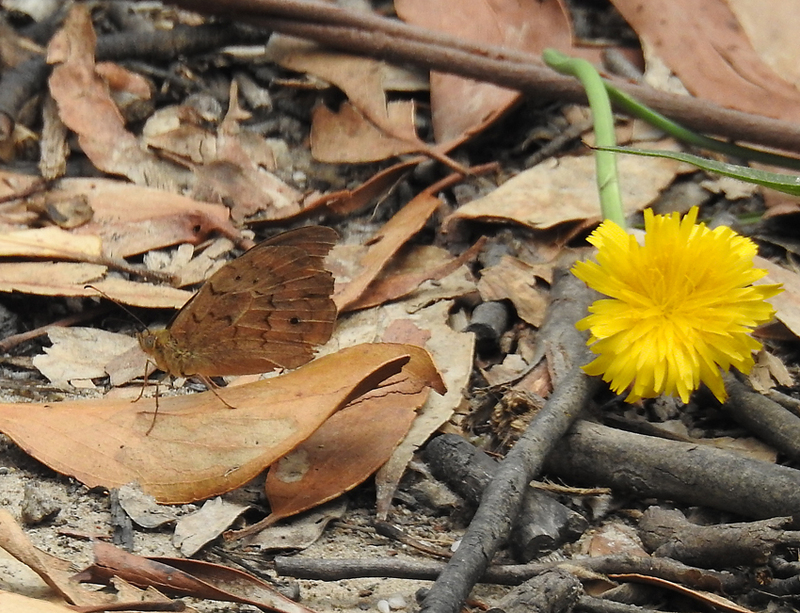 A few species of flowering plants are beginning to bloom in the leaf litter and under story and the contrast between them and a well camouflaged common brown butterfly provides a striking image. Today I have only wandered a little way along the trail that leads to the old diggings but I am determined to return later in spring to investigate more of this fascinating area. For now I shall climb back into the car and head for ‘Fred’, a charming little restaurant in Aldgate a just a few kilometres down the road and the home of some of Adelaide’s best lunch time treats. I’ll try the croque monsieur….then go for another walk in the wild to work off the calories!!!! There are some challenging areas when walking the trails around the mine site. A signposted area near the oval with basic shelters provides maps and diagrams of the area. The link does not work well on mobile phones and is best followed through a computer.